Blog Million dollar Riva crashes into Goodvibes! Million dollar Riva crashes into Goodvibes! Our first anchorage in the Maddalenas, near the Spiaggia dell’Alberello on the island Giardinelli, was quiet at night but became very busy during the day. Only a handful of cruising boats would anchor for the night, but they were joined from late morning onwards by dozens of powerboats and ribs. Although there was a decent amount of space to anchor in good depth, most visitors wanted to be close to the shore, in the clear blue waters, so they end up quite close together. Because the day-visitors only stay for a few hours they also don’t pay too much attention to where they anchor. With so many anchors and anchor chains on the seabed, there is a chance of your anchor getting fouled (the general term for an anchor becoming entangled or caught up in something). 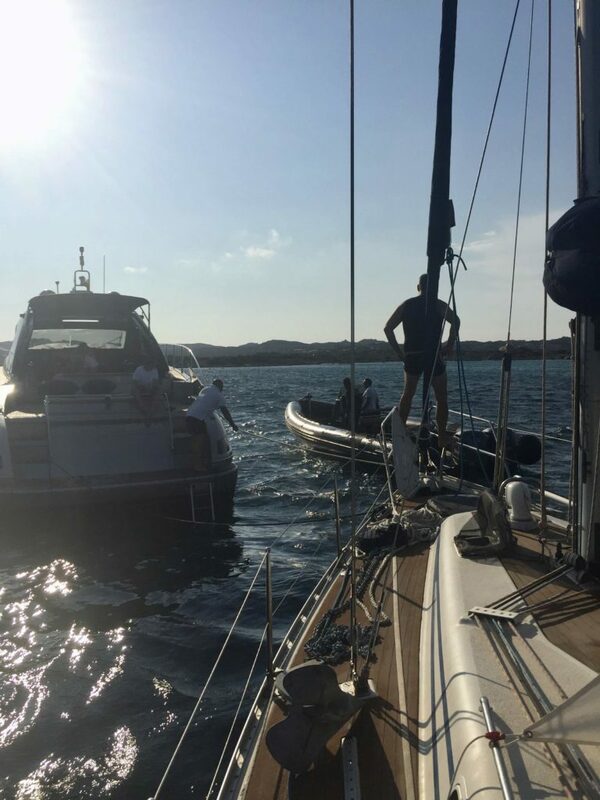 We experienced this first-hand when a fancy powerboat picked up our anchor chain and got it entangled in one of their propellors. It made for a frantic few hours of quick decision making and careful but swift action while the two boats were bumping into each other and dragging towards the rocks. I had seen the fancy motorboat (a 25 meter Riva) come in to anchor in the early afternoon. It came quite close to our starboard and proceeded past our bow. 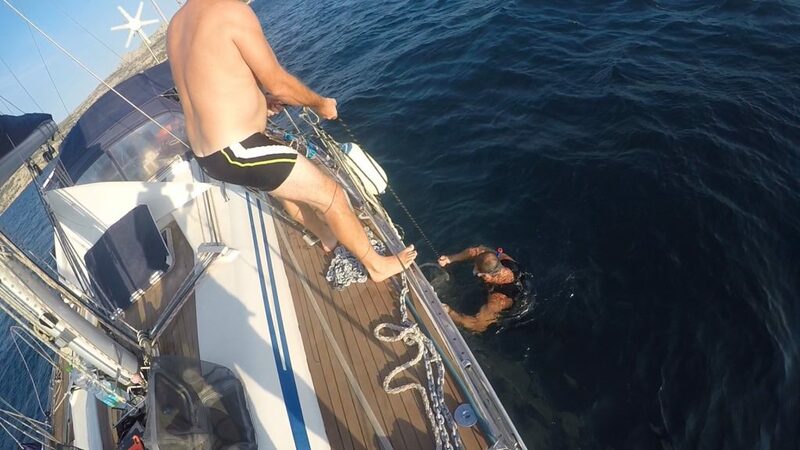 We had around 30 meters of chain out so I checked that he wasn’t going to anchor on our anchor but he went well past it. 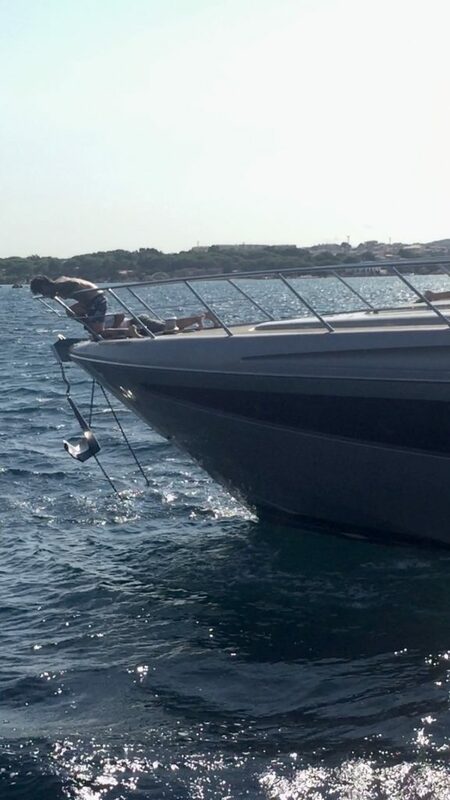 He didn’t put a lot of chain out so he didn’t swung too close to our boat either. 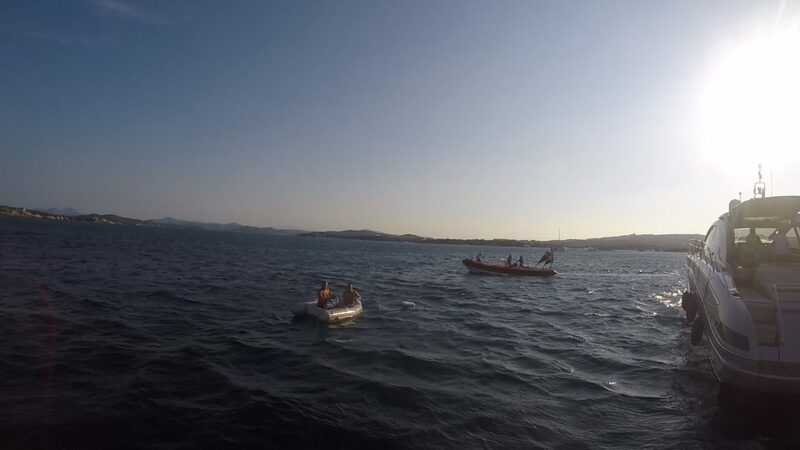 It was quite obviously a charter boat: on board were 2 crew members (easily recognisable in the standard white shirt and dark blue shorts) with a young couple as their customers who spent their time sunbathing, kayaking and taking photo’s of each other. A few hours later, when both Jon and I were below decks, I heard engines starting and chain being pulled up. “That’s the motoryacht in front of us leaving”, I said to Jon. Only a few seconds later I went up to the cockpit. Oh my god! The motorboat was alongside us on starboard and bumping with his side first on our pulpit and then our aft starboard. I don’t remember what I yelled to Jon but it was something along the lines of: ‘It’s right here, you have to come”. We both frantically tried to untie some fenders to put them between the two hulls while also manually pushing the boat away from Goodvibes but we couldn’t avoid some contact between the two boats. The captain on the helm of the Riva put the engines in forward and tried to cross from our starboard side, past our bow to port, but he had our anchor chain stuck on his anchor. At least now he was a few meters away from us and we watched how they hauled up their anchor and tried to get our chain off. This was not so easy though. Their boathook got lost in the process quite quickly. The 2nd crew member then lay down on their bow to try to lift our chain off their anchor. It was too far down to reach though and because their Bruce anchor has the shape of an open claw with raised edges, it was not possible to slide or whip the chain off. As neither of the two boats was anchored anymore, we were slowly drifting away from the beachy shore, towards a rocky shore behind us. The captain became aware of this too and while his other crew member was still at the bow he put power on his engines to keep us away from the rocks. 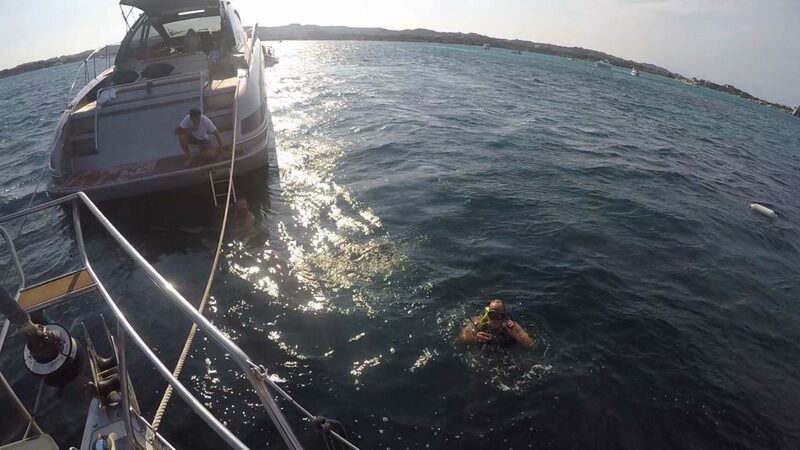 That caused the yacht’s stern to swing around towards our bow – where our anchorchain was only inches under the water. This is where things really turned nasty because he engined right over our chain. Jon saw what was happening but the captain did not realise that our chain was now in his propellor. He also had to keep us off the rocks that we were getting quite close to. The motorboat had 2 engines and the chain was stuck on the port one, but it was difficult to communicate this with the captain (everything happened quite fast, the engine made a lot of noise, the captain didn’t speak much English) so he put both his engines on full. As our chain was being eaten by the prop, it started twisting and curling up which meant our bow was very quickly approaching the stern of the powerboat. We had to let out more chain but our snubber line was still tied on to the cleat on the bow. Jon very quickly untied it and threw it in the water. He then had to cut our second snubber – which is fixed right next to the windlass in the anchor locker – which is just a little hook on a short piece of string. Now he could let out more anchor chain but due to the force of the propellor winding it in, the chain was violently pulled through the windlass. The captain had to stop his engines or he would pull in Goodvibes completely. 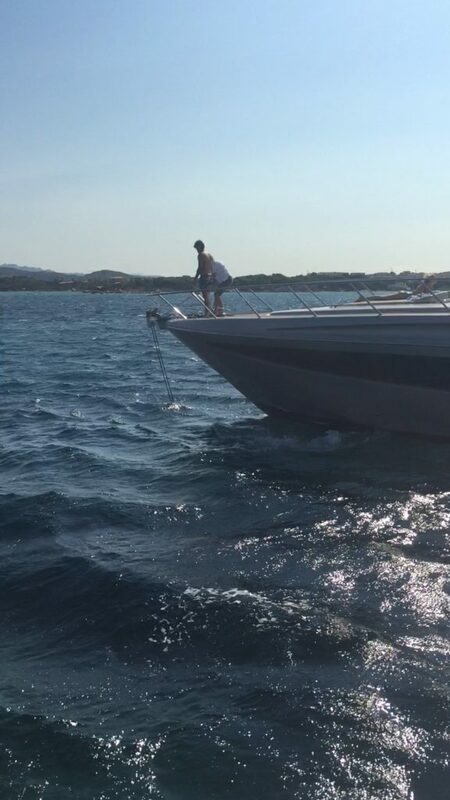 We had to stay clear of the rocks so the only solution was for the powerboat to drop its anchor, which by this time was freed of our anchor chain. We tied two lines from their stern to our bow so whatever happened with the chain, we would not be able to drift off. This also gave us some time to breath and think about the best way forward. 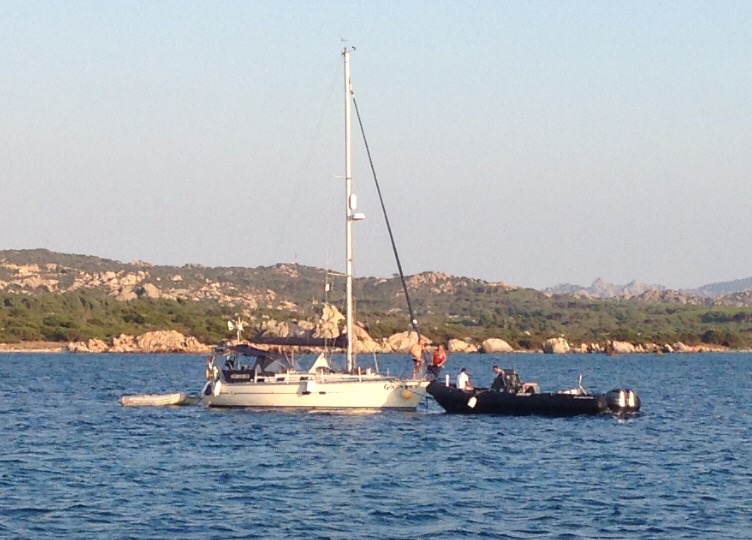 Our friends on s/y Wilma were on their way to our anchorage as they had left Cannigione a day later than us. I sent them a message to tell them what was going on and to see how close they were. Whatever we were going to do next, it would probably involve diving in the water and hauling up heavy stuff. It would certainly help to have Fredrik’s help for this. They were only a few miles away and immediately turned on their engines to get to us as quickly as possible. Jon dug out our second anchor from the bottom of our aft cockpit locker. With our primary anchor out of service the spare anchor was prepared to be dropped at any time. Now the focus could be put on the chain again. One of the solutions would be to cut our chain, that would at least separate the two boats but of course would also mean our anchor chain was no longer usable. A preferable solution was to try to untangle the chain from the prop. In the meantime we had been joined by a rib from the coast guard, either they had been alerted by somebody else, or by the captain of the Riva, or they just happened to drive by – we are not sure. They continued circling around us to ensure our area was being kept clear of other boats and to keep an eye on the proceedings. Jon decided to let our anchor chain go out completely. Before doing so he tied a fender to the end of it (the end that was at this point still in the windlass and connected to our bow). He then let all the chain go and untied the very last end. We were now no longer restricted and only kept in place by the two lines to the stern of the motoryacht. For this he needed his scuba dive gear so he could stay under the water for much longer. With the bottles on, Jon went back in the water. 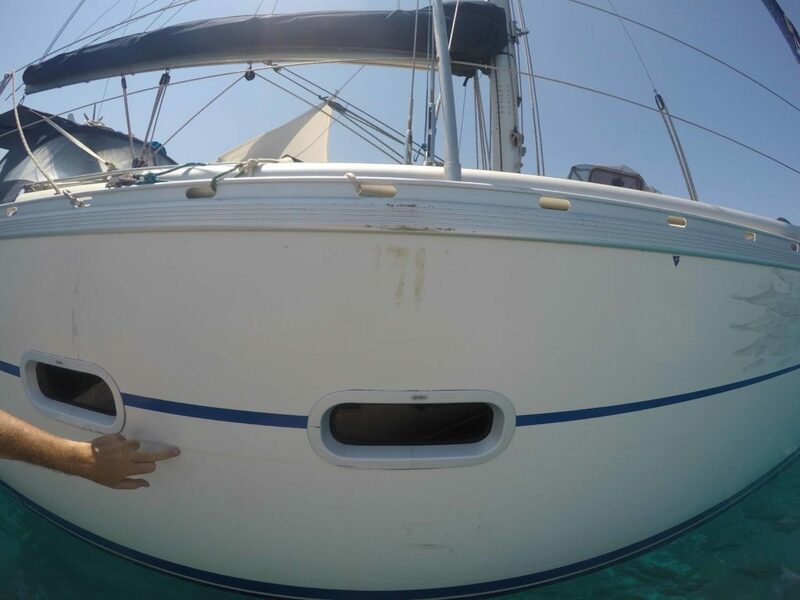 The first thing he did was to tie a piece of line to the anchor, tie that on to the floating fender and disconnect the anchor from the chain. Now he could focus on the chain only. Wilma had arrived and anchored a little bit forward of us. Fredrik was ready to dive in too and to help out. I asked the coast guard, with translation help from the motoryacht crew, if they could perhaps pick Fredrik up and bring him here. That would save Wilma having to put their dinghy into the water. 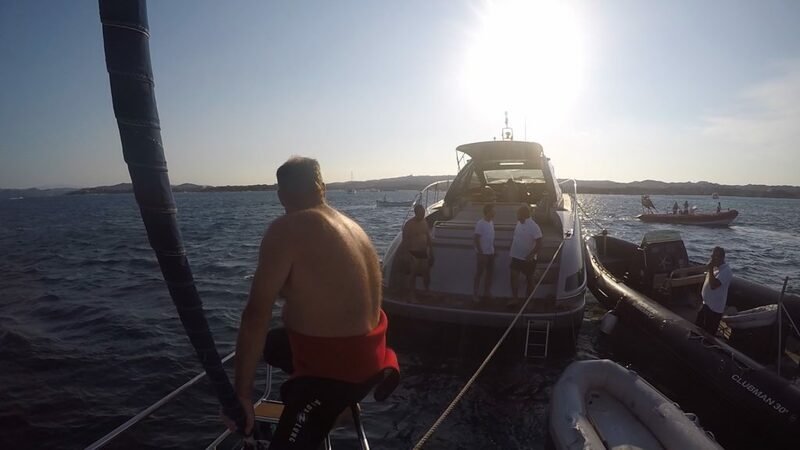 They declined to do this though: apparently they were there to protect only – not to help… (the motoryacht captain rolled his eyes when he gave me the English translation, apparently thinking the same as me: how ridiculous that sounded). 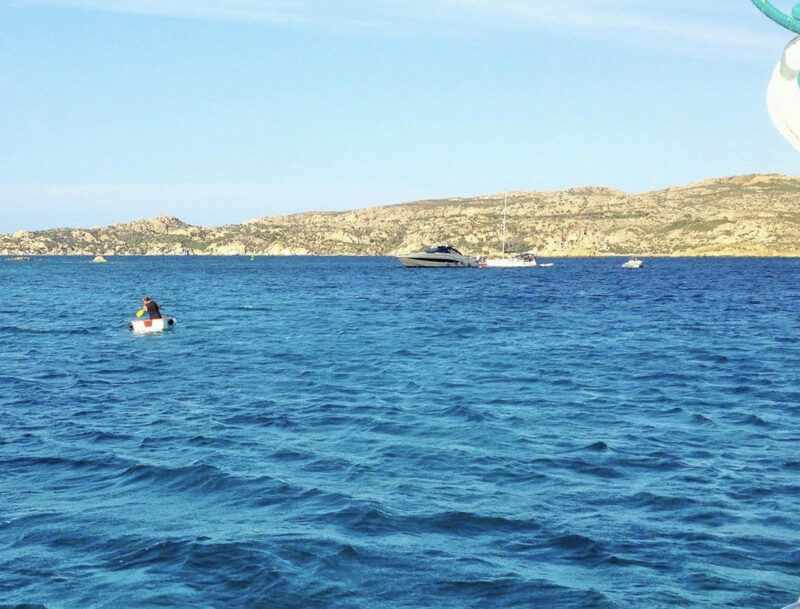 It did not take Helena and Fredrik long to get their dinghy in. To speed things up they didn’t put their outboard on but Fredrik paddled his way up to us. We had by now also been joined by a support boat with a professional diver (we believe this was sent for by the charter company that owned the Riva). They were able to get the chain off the prop in about 15 minutes. The support rib talking to the crew of the Riva. Our second anchor is ready on deck to be deployed in case of emergency. We untied the lines and Jon and Fredrik started the long process of straightening out the chain. We had put our engines on in order to stay in place and avoid the rocks behind us. The support rib kindly offered to tow us instead and to help out with the chain. We were very glad they did as it was heavy work and they also had a nice big surface on the bow of their boat to work on. 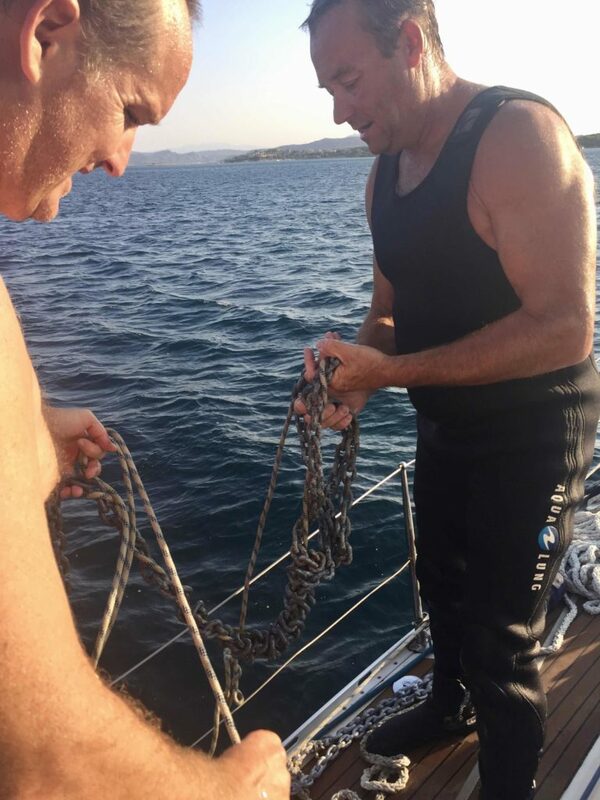 Eventually the chain was all put back in our anchor locker. It was quite a miracle that the windlass was still working considering the strain it had received. It had most likely received some damage inside so we couldn’t trust it 100% (neither could we trust the chain), but we still had to anchor to stay the night. As a backup we deployed the second anchor as well. More than 4 hours later after the whole incident started we were set again and had time to clean up the various lines and tools that we had used. The damage appeared to be restricted to some scratches on the hull, some cracks in the pulpit base and the windlass and chain. More importantly: nobody had got hurt in the process, except for a little cut on Jon’s finger. But now the paperwork… This was our first experience with a claim related to our boat so we weren’t sure of the correct procedure. Our own insurance company, Pantaenius in the UK, explained there were 2 options: either we ourselves got in touch with the Riva’s insurance company or we could leave it to Pantaenius to do so. In the latter case, we would have to pay £500 excess which we would only get back if Pantaenius eventually successfully reclaimed the damage from the Italian company. 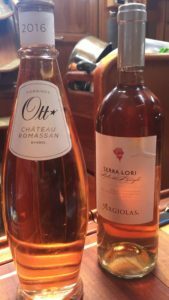 We asked our friend Marcus in Gibraltar, who speaks Italian, for help. He kindly called the Italian insurance company to explain the situation and get an idea what the procedure was. They suggested to send them an email, we could do this in English, to state the details and a description of the incident. We immediately did so and also sent them a copy of the insurance policy Jon had taken a photo off. 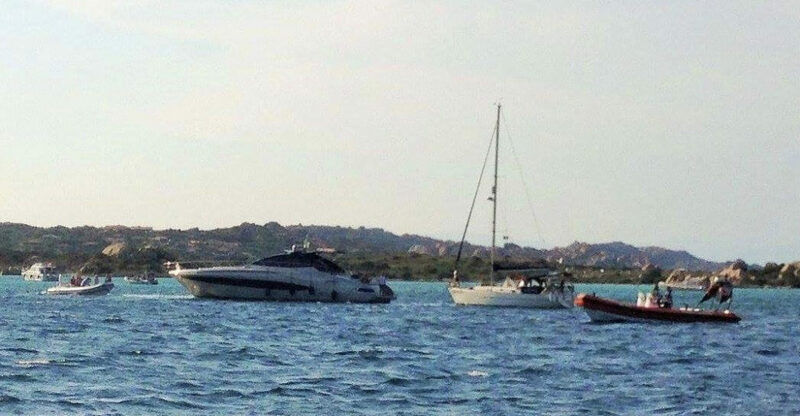 The next day, now 3 days after the incident, we received a reply from the Italian insurance company: the boat with the indicated registration number was not insured with them. It turned out the policy they had shown us had expired last year. So they had either changed insurance companies or perhaps were not insured at all? While we were still processing this information, we were nervously keeping an eye on the arriving day-tourists around us. It was now lunchtime and our anchorage was filling up quickly. We could barely believe our eyes when we saw the same Riva anchoring virtually next to us… It had the same name and registration number but it had no scratches at the back. After the anchor was dropped, the captain walked up to the bow. And yes, it was the same captain! What a coincidence that within the same hour that we heard the details they had given us were incorrect, they rocked up next to us! We decided to both go over to talk to the captain. We had no proof whatsoever that he had deliberately shown us the old policy, so we gave him the benefit of the doubt and approached him very friendly. After we got his attention by calling him and waving to him (he had quite obviously been ignoring looking into our direction up to this point), we asked if we could approach him to talk about the paperwork. He nodded that that was ok, so we took our dinghy and went over. He remained on the bow, keen to keep our business out of sight of his customers who were on the sundeck at the stern. He told us he had been in touch with his insurance company and had told them ‘his side of the story’. We mentioned that we had been in touch with the company on the policy but that they were no longer insured there. The captain seemed surprised that we had been in touch with the company and asked us what our damage was. Jon said that our chain definitely needed replacing. The windlass was still working so hopefully we didn’t to replace that and the scratches were not a big deal. Any questions from us to get the up to date insurance details were deflected and pretty soon he offered to pay us €300 in cash and a bottle of wine to compensate for the damage. We didn’t have to think about this for too long: the chain would be around €450 but we would not have to get involved in any paperwork or stress trying to deal with the insurance companies. While he sorted the money we chatted a little bit and casually mentioned that we saw the scratches at the back were already repaired. Yeah, he replied, the quote for this was around €6000. Indeed a lot more damage than we received! 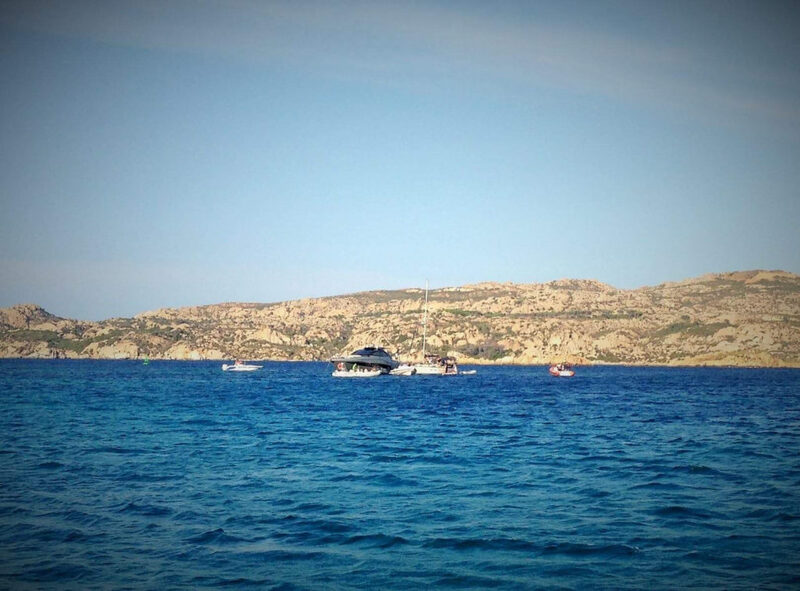 They obviously couldn’t afford to give their customers, who pay over €3000 per day to rent this boat (we googled this), a less than perfect motorboat. We do wonder what the reason was they wanted to keep us away from their insurance company. 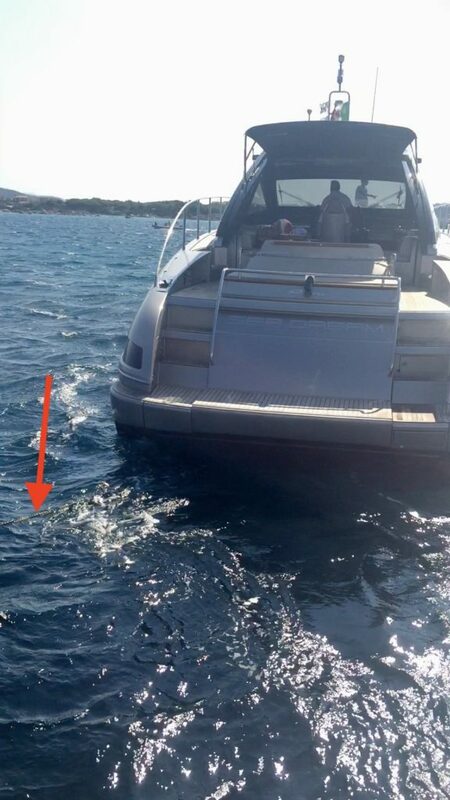 Perhaps in ‘his side of the story’ the Riva was not the boat who dragged our anchor in the first place? Anyway, we can only guess about this. Now we can focus on getting our chain replaced and continuing our journey. Tjoppe (Fredrik) and Helena from s/y Wilma for their help, support, photos and especially the food and wine shared with us after the incident. With hindsight would it have been easier to separate the boats if you had had part chain and part rope rode which could have been cut in an emergency. I like to have some rope instead of all chain because my boat will sail around the anchor and lean against the chain which makes a mess of the long keel. Not uncommon with ketches I have noticed. Yes that would be easier to cut indeed. We prefer all chain as we don’t have the problem with the chain catching the keel, plus our windlass doesn’t support rode. Scary experience and hopefully not too expensive. Remember to threaten to put it on Facebook, Twitter etc. that can sometimes make people pay up. Glad nobody was hurt and not too much damage. Enter your email address here to receive newsletters and be notified by email when a new blogpost is added. We will send you good vibes only!